I am mostly offline, attending a business conference. I have asked several bloggers to post in my absence. This is a guest post by Tom Basson, the spiritual growth pastor at Grace Family Church in Durban, South Africa. You can connect with him on his blog or follow him on Twitter. If you want to guest post on this blog, check out the guidelines here. One of the most memorable moments of my life was crossing the finish line of the Comrades Ultra-Marathon. After eighty-nine kilometers (fifty-six miles), and a grueling eleven hours and thirty-four minutes on the road, hand-in-hand with my mom, I crossed the finish line. We gave each other a hug and each shed a tear. It was a powerful moment I will never forget. And it got me thinking about finishing lines—about how we don’t need them just at the end of a long hard race, but at the end of long hard day, too. Something you never see an athlete doing is going back over the line to run some more. Of course not; the race is over! Yet, so often in my own life, even though the “race” of a workday is over, I continue to “run”—to check email, answer calls, stress about problems at the office—when really I should be resting, relaxing, and giving my presence to my family. That’s why this year I have started to intentionally create “finishing lines” at the end of everyday. As the final activity before leaving work in the evening, I set aside twenty minutes to take stock of what’s happened today and decide the most important tasks to accomplish tomorrow. How did the day go? What success did I experience? What challenges? What did I learn today? About myself? About others? What do I plan to do differently, or the same, tomorrow? Who did I interact with? Anyone I need to update? Thank? Apologize? Ask a question? Share feedback? Taking this time to reflect allows me to clarify my thoughts, collect myself, refuel and renew my mind, and make conscious “course corrections” that ultimately save time and energy. And it’s made all the difference. Since I have started this practice, I am far less grumpy when I arrive home. I feel more in control, and am more clear about what I still have to accomplish. Most importantly, it enables me to “switch off” from work when I’m at home and engage fully with the people I love most. Crossing your finish line, whether at the end of a race or at the end of the day, is something that not only leaves you feeling satisfied and fulfilled, but motivates you to finish well. 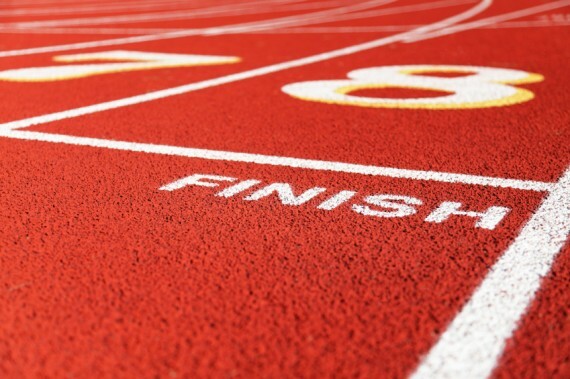 Question: What do you do to cross your finish line everyday? You can leave a comment by clicking here.